Yesterday Eltayeb learnt the word knee. He is 17 and his knee is sore from a football tackle. It's bad news, not because he won't be able to play football for a while but because he won't be able to risk jumping on a lorry to take him from Calais to England. Mohamed is even younger, still 16 for another few months. How many more nights will they have to spend out in the open? By day he and Eltayeb are among dozens of refugees to seek warmth, shelter and somewhere to charge their phones in a building run by the French charity Secours Catholique. Both have fled violence – Eltayeb in Chad, Mohamed in Darfur, Sudan – then endured hellish journeys across the Sahara and the Mediterranean, with hellish stays in Libya and Egypt in between. Today they sit at a table in the centre and are hungry for English. Care4Calais volunteers come here regularly and last week I was one of them. Thirty years ago I got my TEFL (teaching English as a foreign language) certificate and the training has come in handy again after a long time out. We do the present tense. "I live in a forest! ", Eltayeb says, and smiles. “I live in a forest!” He can't believe it either. It’s a wood really, on the edge of Calais, but this is no time to split hairs. We do the past tense. "Four people died on the boat," Mohamed says. He doesn't smile. Not till he gets onto his favourite team again, Manchester United. His memory for scores, players and the dates of trophies is amazing. The next teacher needs to look at the future with them. With the boys round the table are men from Syria, Afghanistan, Ethiopia, Eritrea, Iran, Iraq, Egypt.. Nearby others play chess or cards or Connect Four or look at their phones or sleep on the floor. At 4.30pm the centre closes and everyone heads slowly out back into the rain. But who's that round the corner? It's Care4Calais of course! More volunteers have arrived in vans – one has sleeping bags and packs of socks, scarves and gloves, the other brings hot tea. As people choose stuff, I talk to a young man who left Afghanistan when the Taliban blew up his father. After that he lived in Iran for a year, which he loved. “Iran is beautiful, beautiful country. I worked there but with no papers so deported back to Afghanistan.” He came to France via Germany, which he says also refused to take him. 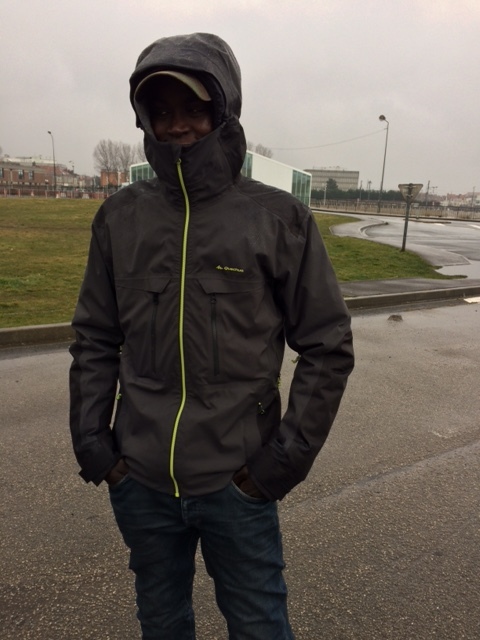 Now he is shivering and coughing in Calais. Another man, Mhretab, left Eritrea a year ago and also has his heart set on London. "I have two brothers and a sister there." He will keep working to that goal, however long it takes. About 1,000 refugees are thought to be living rough in Calais and Dunkirk, a fraction of the 7,000 or so who were in the so-called Calais jungle until it was destroyed in October 2016. They are harassed by police who often take down their tents or ruin them with pepper spray. On the other hand many locals of all ages, from taxi drivers to activists, are clearly sympathetic. To anyone thinking of donating to Care4Calais, I can tell you it's going to good use. The clothes and equipment and tea are vital. The interaction is vital. And to anyone thinking of volunteering for the first time, I can only say: go ahead. You will make a difference and meet amazing people, inside the warehouse and outside in the streets and day centres.